SpiteNET has many features that can be customized to your liking! Some of the menu items are detailed below. ...Speed Adjust the card animation speed and how fast Spite plays his cards. The default setting is Human. If you choose the blink level, don't expect to follow what he does during his turn. You'll just have to trust him. ...Sound gives you 3 sound options: All, Some, No Sound. "All" sounds means the card movement sounds as well as the computer personality's 'voice' sounds. "Some" is just the card movement sounds and "No sound" is useful for when you are playing at work. 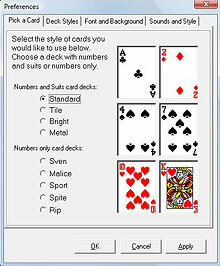 Pick a card - Choose from standard picture playing cards (shown on left) or easy to read number and suit cards. There are also five number only styles which can be easier on the eyes than regular playing cards and since suits don't matter, you're less likely to miss a move. for the card sound effects and game board skins. Font Properties - Depending on the background you choose, you may want to change the font color. The font size in Spite's comments area can be increased. ...Rules You don't have to stick with the "House Rules." If your college roommates say that a Wild card can't be used as an ace, if your grandmother taught you to play with 26 cards and that you have to play an ace if you have one, then here's where you change the rules. ...Opponents Setup Choose how many computer opponents you would like to play against (1-3), and which personalities you would like to play against. Registered users can download Add-on personalities from Spite's Site. Also, if you have sound files (.wav format) that you would prefer to use, you can substitute your wav files for some of the sounds that Spite is currently using. ...Customize Comments Getting tired of Spite's same old comments? Fine, then write your own! ...Background Use the up/down arrow keys to toggle through the available backgrounds. The game comes with many texture backgrounds. ...Add Background Import your own gif/jpg/bmp pictures to be used in the game. ...Display Size Smaller/Larger, Move Cards Up/Down. Useful for 1024x768 large font resolutions when playing SpiteNET Internet games. Makes room for the game's chat window. ...New After the first game, begin a new game here. ...Save If you get busy, need to stop - just save the game and finish up later! ...Restore Select a previously saved game to play or check the Auto Save option to cheat and use it as a take-back-move. ...Previous Turn If you want to cheat and replay your previous turn. ...Restart Current Game What if you had done things differently? Ahh, if life were only this easy. ...Scores and Stats Keep track of your score and game play statistics. Includes a High Stats table of the best run of cards you've had in one turn. ...Start Internet Game Tired of getting beat by Spite? Play a human opponent instead through your online Internet or LAN connection! ...Internet Game Scores Separate score files for each player name you used online and the scores achieved with each online opponent. ...Internet Players Setup and Rules Motivate yourself to win by displaying a gif/jpg picture (avatar) of your opponent and yourself, setup number of human opponents, change the rules, etc. ...Help - User's Manual. Lots of informative and fun help files. ...Tutorial - A great way to get started playing quickly. ...Daily Tips - Why don't people ever read the User's Manual? These daily tips will bring more fun to your game. ...Peek For viewing Spite's hand and is only for cheaters or new players. ...Card Counter Displays all cards that are in play (top Side card, hand cards) and those that have been already played. ...Show Status Bar Current and Best Run statistics for the game you're playing. Also for viewing how many Wild cards have been played during the game. So if you really believe that Spite always gets more Wild cards than you do, leaving this display visible will put your mind at ease. Random is random. ...Register If you enjoy this game and can appreciate all the hard work that went into making it, you should pay for it. It's not much to pay to keep Spite as an opponent! $22.95 U.S. by check or money order through mail-in registration or pay by credit card through secure online transaction. ...Visit Spite on the Internet… If you are online, it will open your web browser and take you to Spite’s Site. ...About… Version Number, Author, etc.